February 12, 2016—Pensacola, Fla.—Visit Pensacola, in partnership with the City of Pensacola, the Greater Pensacola Chamber of Commerce, Florida West Economic Development Alliance and the West Florida Regional Planning Council, is inviting the public to attend the “Welcoming Amtrak!” event at 7:15 a.m. on Friday, Feb. 19, at the train station located at 980 E. Heinberg St. in Pensacola. The event is being hosted to support the renewal of Amtrak’s passenger train service in Pensacola. Service along the Gulf Coast has been dormant since 2004. 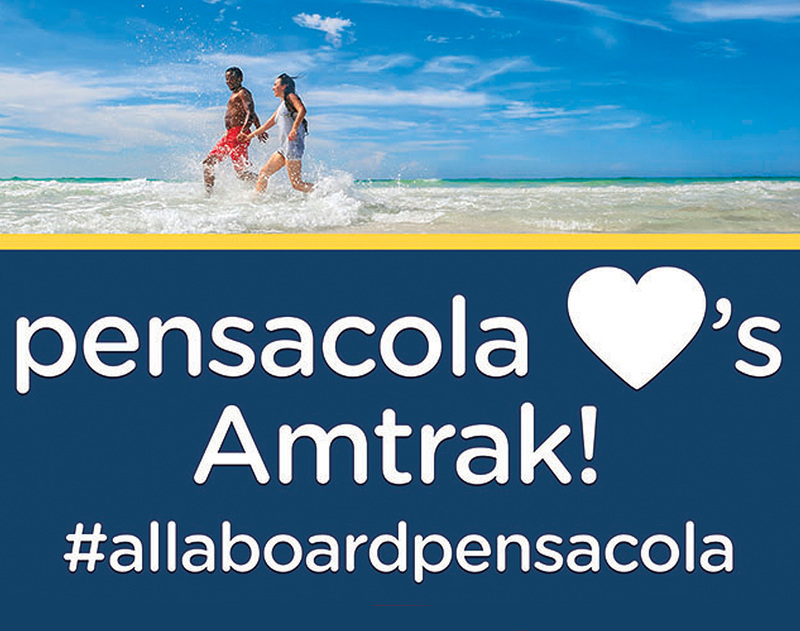 The public is asked to bring beads, signs, flags and banners with messages of support to provide a warm Pensacola welcome for Amtrak’s Inspection Train and visiting dignitaries. Amtrak and the Southern Rail Commission (SRC) are conducting a tour to examine new ideas for intercity passenger rail by operating an Inspection Train from New Orleans to Jacksonville on February 18 and 19. The Inspection Train, hosted by Amtrak President and CEO Joe Boardman, will be stationed in Pensacola Friday morning, Feb. 19, departing around 8 a.m. The train will carry elected officials, industry representatives, community leaders and federal stakeholders from Louisiana, Mississippi, Alabama and Florida. The goal of the invitation-only trip is to examine the existing CSX railroad infrastructure and to better understand the rail’s economic, cultural and mobility opportunities. It will provide an unparalleled perspective on reintroducing intercity passenger rail along the Gulf Coast. Connecting the cities and towns along the Gulf Coast with passenger rail is one of the top priority projects for the Southern Rail Commission.